This is a sketch of my neighborhood in Menglembu. 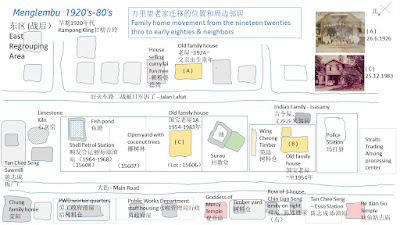 It also indicates where the family house has moved from the early 1900’s to 1984. Within the span of 80 odd years the family home has moved 3 times from (A) to (C). Grandpa should have been one of the earlier settlers to come to Menglembu. He arrived in Malaya probably in 1900, when he was 17 years old. He married a Peranakan (谢氏) in 1904 at 21 years old, and had his first son (锦荣) in 1905. The eldest son married in June 1926 at age 21 to a maiden in the Leong family (梁氏). The wedding photograph was taken in June 1926. The family probably moved to location (B) in the 1930’s. The house was located across the railway line between the police station and the surau. The house included a big yard and an office. Grandpa was in the timber business. The company’s name was Weng Cheong – 荣昌. The expanding business probably required him to look for a bigger plot of land. The yard was for storing logs, timber and planks and to park the trailer lorries. The lorries were for carrying logs from the forest. The timber and planks were for the tin mining industry to build palongs (wooden sluices), quarters and offices. During the war (1941-25) when the tin mining & timber business was disrupted, Grandpa diversified into cheroot cigarettes. The office and yard were converted into makeshift factory for making cigarettes. The family moved here in 1954, when the police station expanded to build staff family quarters. The original land size occupied three lots which Grandpa bought from an Indian owner. The area was planted with coconut trees and there was a fish pond in the middle lot. The double story bungalow was originally located in Lahat. The ground floor was cement, and the upper floor wood. The owner used it to settle the debts owe to the timber business. 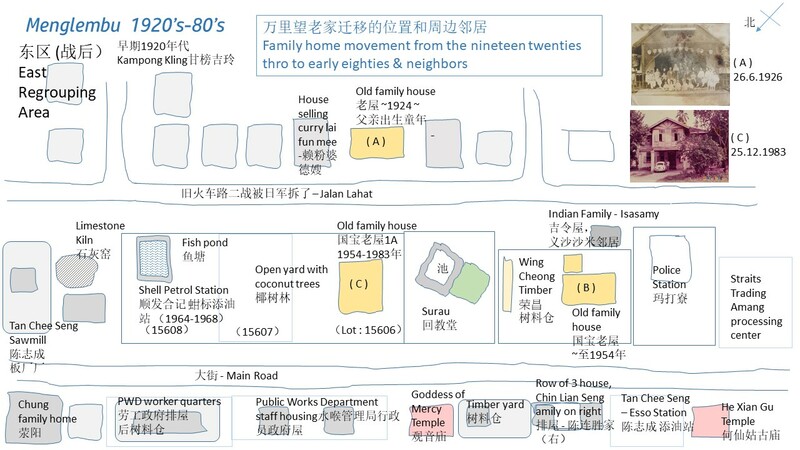 In 1984 the family moved to Taman Sentosa near to the foot hill of Kledang when the new housing estate was developed. In the year 1909, soon after the lantern festival 元宵 a young girl of 17 left her village in Mexian 梅县, China for Nanyang　南洋. 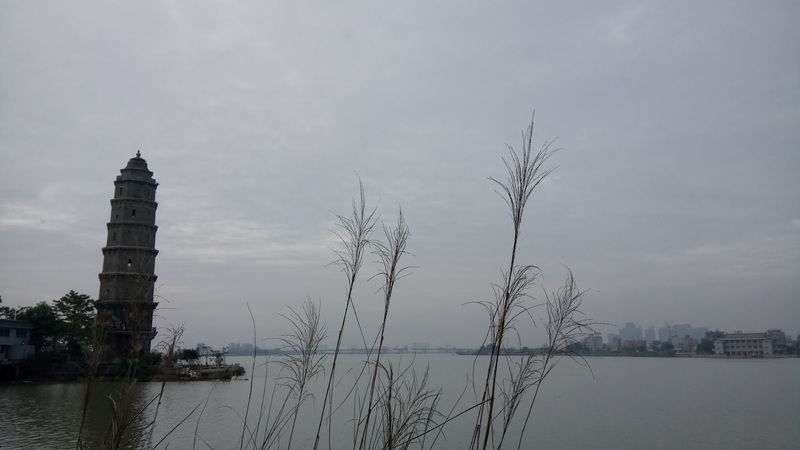 She travelled down the Meijiang river 梅江 and to the coastal port of Shantou　汕头. From there the sail went up to catch the north-easterly winds and the boat set forth along the ancient trade routes of the sea heading south. She landed in Malaya in March that year. Around 1916, this daughter of the Chew family (邹), name See Moi 泗妹 married Kwet Chin 国祯, a widower aged 33 years old. Their matrimonial home was in Menglembu, an outpost that supported the many tin mines around the Kinta Lahat district. The couple went on to have 6 sons and 6 daughters, over a span of 15 years. Completed in 1619, towards the end of the Ming Dynasty it was a landmark for the migrants from this region of the Hakka heartland on their treacherous journey to Nanyang in mid-19th to the 20th century. The pagoda is located at about 3.5km from Songkou 松口on the middle reaches of Mei Jiang 梅江. Centuries earlier the pagoda could have guided the Ming princes and their courtiers as they escaped south from the Manchus. Legend had it that the Shide Mansion 世德堂 in Tongpa village 铜琶村 about 1.2km, was purposefully build to host the fleeing court. 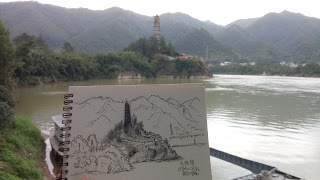 As the Meijiang flows down the mountains towards the lower reaches, another pagoda came into view. The Pheonix Pagoda 凤凰塔 is located in Chaozhou 潮州. It was build thirty odd years earlier in 1585. This section of the river is named Hanjiang, 韩江. It was named in honor of Han Yu 韩愈 the Tang Dynasty official and great poet who was banished to Chaozhou, because he was against the ceremony of the Emperor receiving the Buddha's tooth relic. In the 8 months that he was there, he did much to improve education, agriculture, pacify the crocodiles threating the local folks and free slavery. He left his indelible mark in the city, woods and rivers, that continued to flourish to this day 1,350years later. On the first travel to Singapore, it was in standard two. As it was a big event for a boy of eight, after 50 years has gone by, glimpses of the events on trip were still vivid. The date written at the back of the photographs helped pinpoint the trip to the month of May. Though it would be 3 months before Singapore separated from the Federation of Malaysia, when we reached the Johor-Singapore causeway that morning, I remember Dad and Uncle Hia talking and if they needed documents to enter the island state. As I recalled this conversation of the adults, I had thought that the trip was made post August 1965. However, the date at the back of the photo, help to clear the doubt and point to May. The journey started the evening before by car from our hometown in Menglembu. We travelled in a Toyota owned by 5th uncle. The event for the trip was that 5th uncle’s second child, a son of a few months old was found to have medical problem and was recommended for treatment at the Singapore General Hospital. He married in May27, 1962, and the first child was a baby girl. The mother would be flying from Ipoh to Singapore in a day or two. Our contingent would travel down early so asto meet mother with baby when they arrived in the city state. As dad was familiar with Singapore as he had visited the city a number of times, 5th uncle had probably asked him to help on the trip. The members travelling by car were Dad and Uncle Hia, mum and 1st aunt, 4th brother and myself – 4 adults and two young boys. As dad was managing the Shell petrol station business then, the car was checked and filled full tank at the petrol station early that evening. We left after dinner and the journey took us 12 hours or so. I slept most of the journey as we were travelling by night. As we headed south, we had to cross the Muar river on a car ferry, as there was no bridge then. We are travelling in the dark most thro the night, and I recall on reaching Ayer Itam we came to a lighted multistory building, a sort of a land mark of sort at a turning where we turn right on our south bound ourney. We arrived in Johor Bharu at dawn, and headed to the causeway to clear the checkpoint. It was there where the conversation if a pass or paperwork was need to enter the city state. We stayed at the 4 storey Tian Yi Jing Hotel天 一 景酒店at Peck Seah Street. The escalator had the double layer fence type gate. The rooms had ceiling fans, and windows with half-curtain. I remember we left piece of clothing behind at the hotel. It was my home made jacket by mum (冷衫). Recall that we had dinner at the open air food center at the busy Peal Center area –珍珠坊. A vagabond unkempt beggar with long hair was grabbing the leftover food in the next table with his bare hands. Among the many legendary and mythical figures from Chinese history and folklore that dad narrated. I learnt of Sumu tending to flock of sheep while in exile in Siberia, 蘇武牧, of Jiang Taigong fishing with the bait above water, 姜太公钓鱼。There was the infamous 18 levels of hell, punishment meted out according to the degree of severity of sins and immorality committed while in mortal life. The visit to Haw Par Villa perhaps planted the latent interest in Chinese history and culture in this young mind. While the elders we at the medical center, we wandered outside the building. I recall next to the ward was a steep grassy slope. This was probably the next facing the sid of Outram-Tiong Baru. Well, that was the first trip to Singapore 50 years ago in 1965. The next trip to the Lion City was eight years later in 1973. It was a vacation trip organized by the school. This time around we needed a passport. 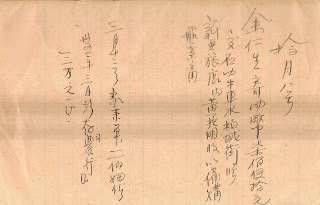 In June 1940, as a member of the Ipoh Yuke Choy School high school graduation class he visited Singapore and stayed at the YinWo Hakka Association. 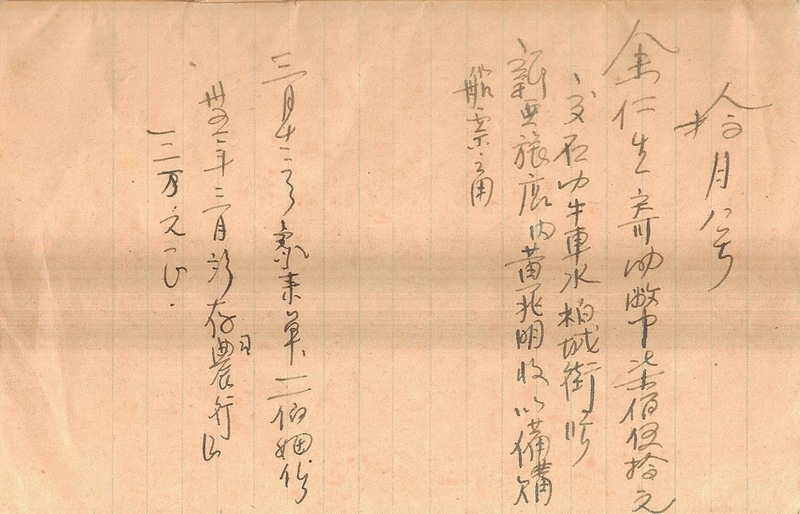 In Oct 1948, on his journey with grandmother to Meixian, Songkou in 1948 to attend to grandfather’s late estate he would have transited in Singapore. A few years later and probably in 1951-52, he accompanied 6th uncle in transit at Singapore on his way to New China. Perhaps his first trip was around 1928, when he was 4 years old. 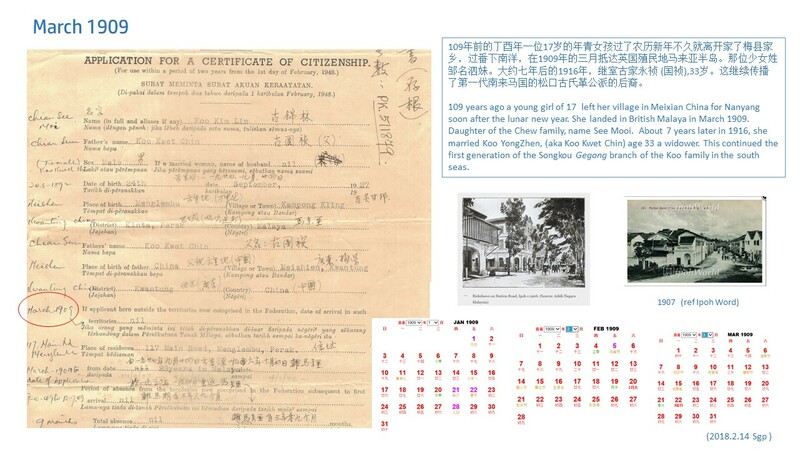 He probably transited in Singapore while on his journey to the home village in China, with 2nd grandaunt. 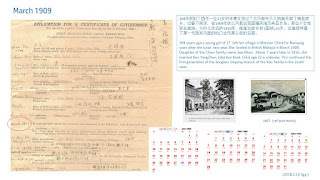 The Chinese hotels in Tanjong Pagar - 新亚旅店and 天 一 景were trusted hotels the family stayed when they transit in Singapore on their way to China home village before the War. EuYanSang Ipoh, Oct 1946 wired $750 Straits dollars Mr Huang Zhaomin of Xin Ya hotel in Peck Seah Street, Kerea Ayer, Selat for preparation of boat fare and other use. Singapore was written as Selat 石叻 in Chinese then. This was probably for the final journey of grandpa to China, after a sojourn of close to 50 years in Nanyang. Among the members of this trip were sons, 4th uncle, 5th uncle , and grandson – Brother Pang 鑫权. 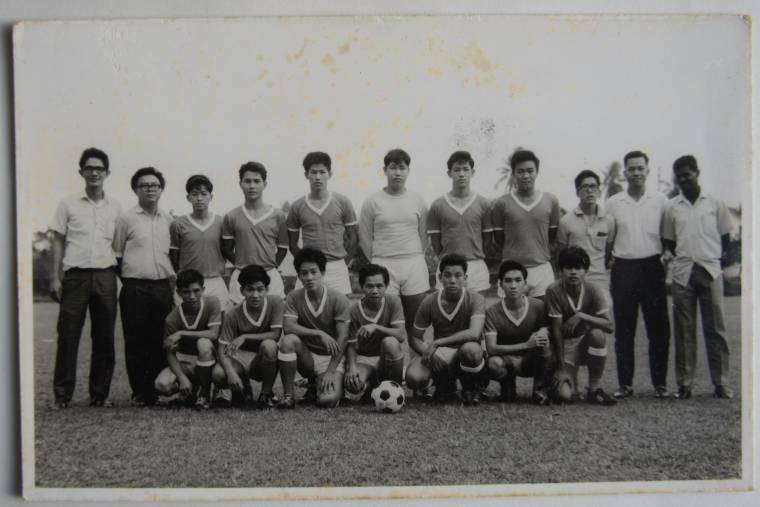 This photograph of the Menglembu football team was taken on 12September 1967. As to the venue, it was most probably in an out-of-town match at the Coronation Park padang in Ipoh -the current Taman Dr Seenivasagam. Squatting – left to right :Dai-gor Seng, Ah Chow, Hon-da-sport, Dai-nan Choy (younger brother of Dai-gor-Seng), Ah Hoi, Yee Chai, Ah Bai. In the 1960’s and 70’s, the padang in Menglembu, adjacent to the Wan Hua Primary School, would be a hive of activities in the early evening from 5 pm. Youngsters from around town, the re-grouping area and as far away as Bukit Merah would gather there for evening of soccer. Among this cohort, there were three brothers, namely Ku Li, Fei Lou Zhong, Ah Boot. The eldest Ku-li was 20 years old, the 2nd brother Fei-lou Zhong was 18 and the 3rd, Ah-Boot was 16 years old then. The soccer kaki's would visit the home of the brothers and they were good buddies. Ku-Li and Ah-Boot went on to play for the Perak team. Both of them were in the Perak team that won the FAM cup in 1970, beating Kelantan 2-0. Ah-Boot made it to the national team. 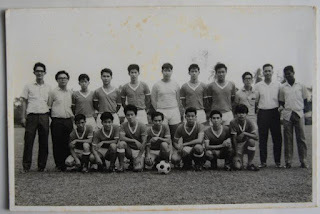 In 1969, he played for the Malaysian team in the Asian Youth Football Tournament in Bangkok. The AYFT was the beginning of the many travels that his football career would bring him to. It was Tokyo in 1970 and Manila in 1971. In 1972 he was a member of the Malaysian football team to the Munich Olympic. On his return from the Olympics, he proceeded to Hong Kong and started his professional soccer, first with the Caroline Hill Football Club . The afternoon heat has mellowed. The padang is as verdant. The single story assembly hall is still there in the same location at the far end of the padang beside the road. Many of the garden houses 菜园屋 , next to the padang, ( wooden house with zinc roof surrounded with a small garden ) are still there. They have stood there for 60 years and more, witnessing many a generation of youngsters playing soccer. The goal posts are no longer around. Where have all the youngsters gone? This class photograph was printed on a photo card format, with a pencil marking ‘1940’. With traces of autographs on it – it was probably the graduating class of 1940. Dad was standing in the middle row- seventh from right. He looked a smart and handsome 16 years old. This class photograph was probably the remedial English school that he attended. He mentioned before that he attended English lessons on the top floor of the Foong Seong Building – in front of IPOH new town – wet market. As to the school that organized the classes, if I recall well what he said, it was probably the Anglo-Chinese School, Ipoh. I wonder if someone could recognize the teachers in the photographs. PS - In the same year 1940 dad graduated from the Yuk Choy School. The graduating class from the Chinese school went on an excursion to Singapore, and he had left behind a number of photographs from that trip. Wan Hua Primary School in Menglembu celebrated the centennial in October 2014. The Chinese medium school is an integral part of the memory of the residents of Menglembu. This article recorded the events connected with the school in the 1960's and 70's. As it's a Chinese medium school, the article is written in Chinese, however broken it is. The photographs were taken in 1958. They were of my sister and her classmates. Sister acted in the stage drama in the 14th primary graduating class that year。She was in a long white sleeve shirt, make-up as a young guy. In the photographs taken at the school garden, was cousin Li, the 2nd daughter of 3rd aunt. She is of same age as sister, and they were together in same class. Many of our cousins, and my siblings had their primary education in this school. The hubby of a cousin Yoke Lin was a teacher in the school, and they stayed at the school quarters for a while with their two young kids in the late sixties. There were talent time contests, weekend cinemas and wedding dinners at the school hall. There were remedial Malay lessons in the evening which I attended, and these were some of the memories of the school.